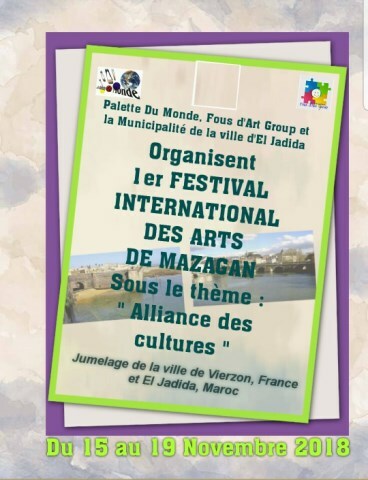 AFIN DE BIEN PRÉPARER CE FESTIVAL, QUE CELLES ET CEUX QUI SERAIENT INTÉRESSÉS POUR Y PARTICIPER LE FASSENT SAVOIR A NOTRE BUREAU DE MEKNES AFIN D’ÉVITER LES ALÉAS DU FESTIVAL DE HALLE EN ALLEMAGNE OU LA PARTICIPATION DE LA FRANCE A ÉTÉ PEU IMPORTANTE. LE PRIX DU VOYAGE ( TRANSPORT) EST A LA CHARGE DE L'ARTISTE. LE PAYS ORGANISATEUR QUI REÇOIT PREND A SA CHARGE L’HÉBERGEMENT ET LA RESTAURATION. LES STATUTS DE LA PALETTE DU MONDE DOIVENT ÊTRE RESPECTES A CE SUJET. La Palette du Monde .